Join over 5 crore sports fans and be a part of India's Biggest Sports Game this IPL. 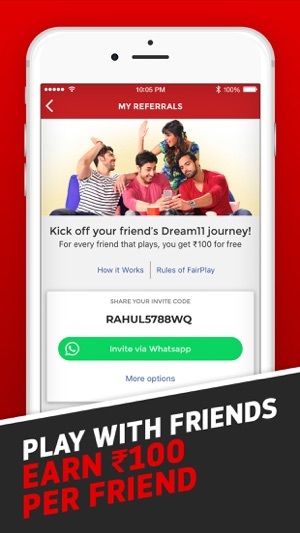 Use your sports knowledge and skill to win BIG only on Dream11! Ready to be a Champion? It’s time to unleash your inner MS Dhoni! 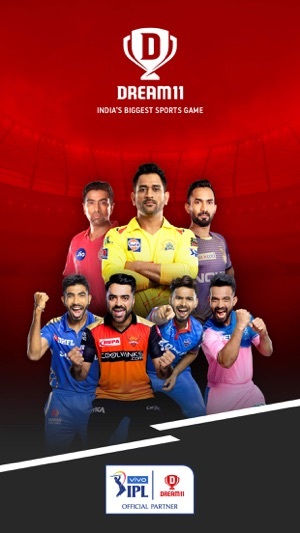 Pick your top performers - MS Dhoni, Jasprit Bumrah, Rashid Khan, Dinesh Karthik, AB de Villiers, Rishabh Pant, R Ashwin, Ajinkya Rahane or anybody else - as captain and vice-captain to score bonus points and rise to the top of the leaderboard! • Be part of the action as your favourite IPL teams compete in T20 action - CSK, KXIP, MI, SRH, RR, KKR, DC and Bangalore! 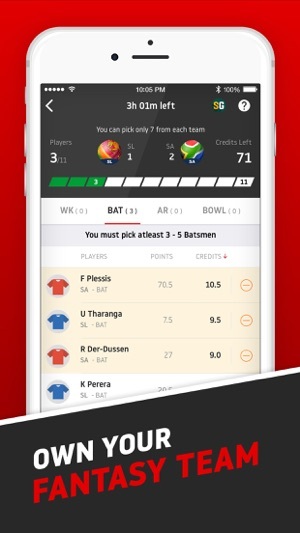 • T20, ODI, Test, T10 - Create your Fantasy Teams for all formats! • Champions Rewards - Play more contests, earn more Rewards and Bonuses! Rate us! Your feedback helps us to up our game. 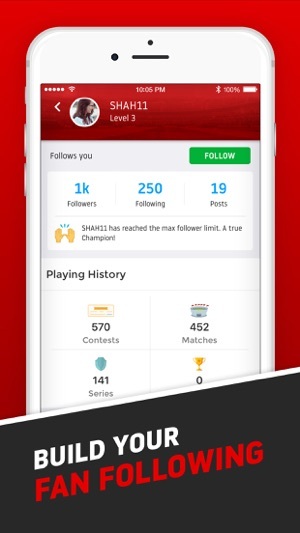 -Get Social: Follow people, get followers, share your teams and become famous! 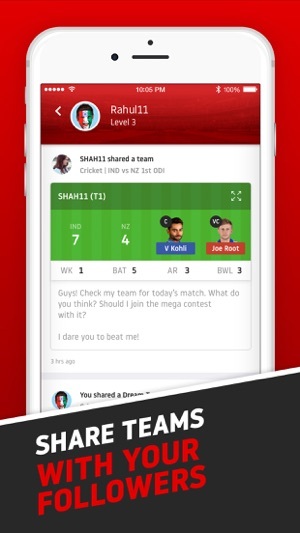 Can't get enough of Dream11- India's Biggest Fantasy Sports platform? Rate the app, tell us all about it! Yesterday was my last day on dream 11, i was a genuine user of dream 11 nd played over 5000 contests nd always write whatever is happening in MATCHES but they never replied back with satisfied answer, I dont have option otherwise i wud have posted screenshots of my teams, every day those ppl are winning those played very less number of matches. Why why why why why? I chose pollard over Rahul Chahar, this was such a huge mistake, I mean who wud not take pollard? who scored over 80 runs in his last match, its so so frustrating, and its not about yesterday, everyday just bcoz one player same thing is happening. I think there are many ppl in dream 11 or may be outside of dream 11 know everything who all 11 players are going to perform in every match bcoz they all are god. Be assured that there is no scope for any cheating / inappropriate activity on our platform. No changes can be made to your teams and no new teams can be added to a contest once the deadline hits. For Transparency, we have this feature called "Competitor Tracker" where you can download information of all teams joined in your contest and track them through the match to see for any changes. Our testimonials do cover users who have been playing and winning on Dream11. You are able to see a winners profile right on their profile page to know the playing history of the individual. So many changes in the app. Very appreciative move by dream11... 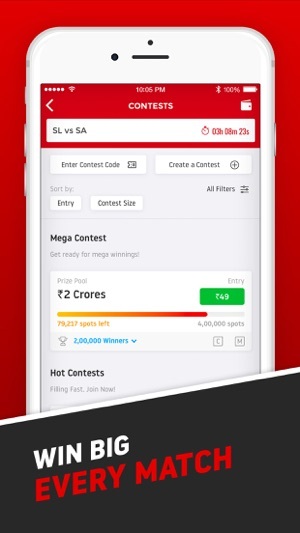 I already suggested that if dream11 will not change in their app they will lose the market share by the competitors who have some good features... but still the level of transparency is very low... let’s take an example of this IPL... 95% winner of grand league are the player who playing their first match and after that you will never find them in any competition/ league.. now there’s some common things in most winner of grand leagues... firstly their name is in all caps... you can say that it’s their by default name... agree but second point is that most of the time let say90% the team number 1 won the grand league...while writing this review the person who is on top at this time in the grand league prize money of 25 lakh is the person who hardly won 6 matches n level of 19 n the team number 1 with the all caps name...one more point you will never found those winner in leaderboard section..
Y don’t u show the team name as exactly what is there in pan card n instead of cartoon profile pic y don’t u put person’s pan card picture there. Don’t u think it’ll increase transparency n trust in ur app otherwise we would keep thinking that u r making us fool by either creating 1000 best possible teams from your own or by doing some technical misuse. There are so many contests played everyday but I haven’t heard a single person from our surroundings or through social sites that they have won this high amount in Dream11. Y so????? Else u can start displaying person’s identity at least who have won 1 to 10 lac so that others can believe that it’s not a fake app. Pls think about it otherwise everyone will start refraining ur app. Still no reply i have received from ur site. I think we have to initiate some legal action against u so that u can’t cheat more people now. Be assured that our team always looks out for ways to bring in more transparency in the system and so they are already working on the profile picture feature. As PAN Card names may not be unique, we have a team name feature where you can set a unique team name for your Dream11 account. Also, our testimonial section does include pictures of the members who have won huge on Dream11. You can head over this section to see those.